Eggs in Purgatory Recipe | Exploring Food & Drink in D.C. Crack eggs into a small bowl. Make sure all shell pieces are removed. Set aside. Heat a medium-large skillet over medium heat. Add olive oil, red pepper flakes and minced garlic. Allow to cook for 1 minute until flavors become fragrant. Gently add in entire can of diced tomatoes. Carefully slip in eggs making sure to separate them a little. Don’t cover the yolk with the tomato or juices unless you want a more solid yolk. Grate some Parmesan cheese over the whites and tomato. When whites have mostly set, remove from heat, and grate some more Parmesan cheese. Serve warm with toasted crusty bread. 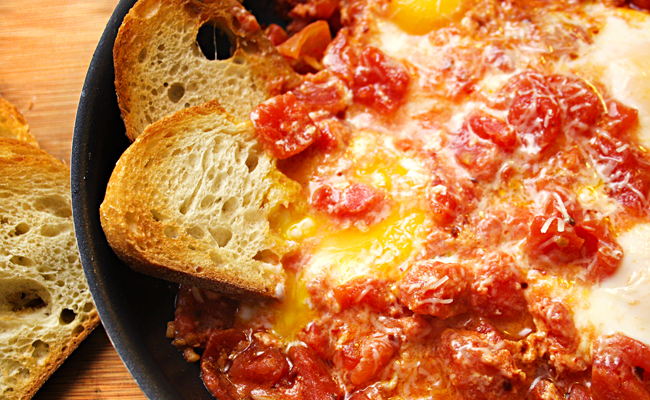 Tags: Eggs in Purgatory, Leite's Culinaria, recipe. Bookmark the permalink. Love the name of this recipe!! this sounds delicious. this would make a nice breakfast, so much better than cold cereal! Pingback: In The Kitchen With Lupo Verde: “Green Wolf” Cucina & Bar Now Serving Brunch | Exploring Food & Drink in D.C.